Salutations, my review reading visitors; Today, I shall be reviewing Neon Runner Remix by Nford. Nford appeared at my reviewing center in an attempt to showcase his game. My expectations, in all honesty, were not that high, having never played Nford’s games. Could my theory be true, or would I be surprised in finding an amazing game maker? Let us find out. Starting this game came to a bit of a surprise. The game was called Neon Runner Remix, but the color scheme possessed an unappealing orange background, not typical to anything being advertised as “Neon.” I simply shrugged that off, hoping it to be a minor error. There were also numerous control issues that I noticed throughout the game. I was not really anticipating this many errors in the game. If I were allowed to elaborate on the first level, I simply found it clunky, noticing a high dependence on the double jump glitch. I couldn’t really get into the game because I kept dying due to unreliable jumping patterns. But enough on the first level; How did I find the game as a whole? 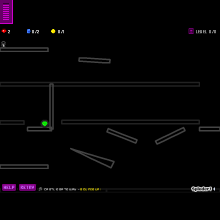 As I mentioned before, the title of the game suggested neon, but much like the first level, the colors were not a proper setting to accompany such a title. Upon thinking “Neon,” one thinks of bright lights and black backgrounds. This game however, through that assumption out the window. While I appreciate artistic liberties, the colors basically made me conceive notions that I was being misled with false claims of neon. Enough of my incoherent ramblings based on color, though. Overall, the designs of the levels, as a whole, were uninspiring. The gameplay displayed in this creation was, to say the least, interesting. Upon several occasions, I was confused as to what was going on. In one level, the player spins around in circles with only the clue that a magnet is supposed to be used. This created frustration and made me question why the creator was so vague in assistance. The gameplay was simply too irritating for me to cope with, giving me no feel of joy upon completing a level. The difficulty I experienced in my playing was more than what I could have bargained for. Relying so heavily on blind luck instead of skill and timing simply annoyed me to no end. If anything, this game was based on complete randomness. Now personally, I love a good challenge, but this game was just too irritating to enjoy. The fact that it is impossible to play the game without having to restart fifty times, without really giving any sense of fulfillment just makes this game a huge disappointment. I would like to take the take the time to elaborate on certain concepts that I’ve found irritating, as I didn’t elaborate to well. One level in particular, was annoying. The color scheme was white outlines as normal platforms and black outlines as platforms that take away life. The entire level was confusing. At random points, normal platforms would just send you flying off into one direction. There were also instances that the platforms were extremely slippery and would result in you hitting the black platforms. There was nothing truly noteworthy to put for this category. Simply bad color scheme and layout altogether. This game was simply repetitive. Concepts were confusing, only with the creator knowing what to do. Frustration is quite obvious since the first level. Truly a shame. I only reviewed this game because it was suggested in my Review center. I played through the entire thing hoping there was a silver lining, but instead, found the exact opposite. As stated in the beginning of the review, expectations were not high at all. From what I’ve experienced through this game, I have determined that this game is nothing more than subpar. It was lacking in the aspects of providing entertainment, which is truly disappointing. The color scheme provided was a misinterpretation of the term neon, giving me nothing much to work with. Everyone might have already drawn my conclusion from the review, but I would like to suggest that this game is definitely not feature worthy. Sadly, I strongly suggest you avoid playing Neon Runner Remix.